In 2006, Hiroaki Kato lived and studied at Yogyakarta, Indonesia for one year. At that time, there was a huge earthquake in Central Java and more than 6000 people were lost. Hiroaki Kato volunteered himself as a musician to entertain people that suffered by the disaster along with other Indonesian universities organizations. and made an appearance in one of Indonesia’s independent movie. and started his carrier as musician, actor, Indonesian language lecturer, translator, and also as an interpreter. he begun his carrier by doing live performance from stage to stage. Hiroaki Kato thought that now is the time to launch an album. There are 10 powerful songs in this album that each song has its own uniqueness and character. 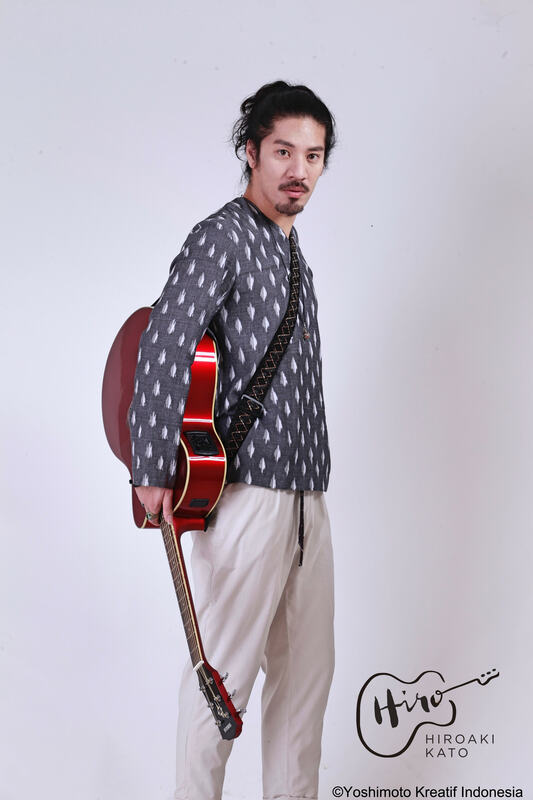 Single “Terima Kasih” became the representative song of Hiroaki Kato. Furthermore, the uniqueness of this album is that he sings with 3 languages, Indonesian, Japanese, and English. Each song is colorful and has different character and mood, that is what makes people don’t get bored by listening this album. Hiroaki Kato wishes that this album could be an inspiration and be a part of Indonesia music industry. After Hiroaki Kato launched the album, he is now having a lot of upcoming live performance in Japan and several cities in Indonesia. HIROAKI KATO officially sing a Japanese version of theme song Asian Games 2018 Jakarta Palembang and Asian Para Games 2018 (Bright as The Sun, Meraih Bintang [Hoshi wo Tsukame], Song of Victory [Shori no Uta]). "Laskar Pelangi” by Andrea Hirata into Japanese language which sold 5,000 copies. He also translated COWCOW ‘s (Yoshimoto Japan Comedian) song called : “Senam Yang Iya Iyalah”. Hiroaki Kato’s specialty as MC is that he can do 3 languages ; Indonesian, Japanese, and English. His early job was in 2014 when he became the presenter of Indonesia’s travel TV program called “Indonesia Banget” on RTV station. He remains active on appearing in Indonesia TV Programs. He is one of the presenter in “Quiz Surprise Japan” on Waku Waku Japan Channel and hosted "Roaming” on TRANS TV Channel. Hiroaki Kato collaborates with some of Indonesian artists. and sang with Noe, the vocalist in Indonesian and Japanese. “Nada Sou Sou” in Hiroaki Kato album. He also performed with Tulus and sang his song in Japanese. He translates Tulus’ song called “Sepatu” into “Kutsu”.